What did the little acorn say when he grew up? Geometry (Gee, I’m a tree)! Sorry for the ‘teacher’ joke. As soon as we begin to enquire about shapes, we are ‘speaking’ geometry. Originally, it was the mathematics of measuring the Earth, surveying blocks of land for farming, for example. In Egypt, geometry was used to replace boundary markers between properties after the Nile flooded each year. The term geometry comes from the Greek words γη (ge-) or γαια (Gaia) meaning earth, ground or land, and μέτρον (métron) meaning measure. 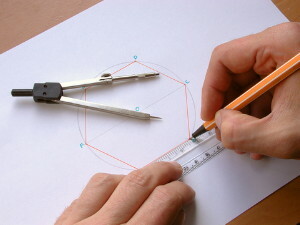 Geometry can be regarded as the discipline of studying abstract shapes with their properties and relationships. It can also be thought of in very practical terms. Tradespeople use geometry every day of their lives, making sure walls or frames are square, having the correct gradients for trusses, roofs, pathways, stormwater, etc. I have workmen on my roof at the moment, replacing corrugated iron sheeting. The art of cutting the sheeting to fit involves some clever geometry! Our boys received a distance education and required additional tuition in their higher level of Maths. Graeme undertook this for us which brought together both his professional expertise and the motivation required for our boys to achieve the excellent results that we all hoped for. Today our boys are following their chosen career paths and we will always remain grateful for Graeme’s part in that. We warmly commend Graeme’s tuition and dedication to his students to you.